Trustgarcetti.com is the campaign site for Roger Garcetti. "The charges made by some of Gotham’s finest police officers against Harvey Dent are extremely serious. These brave men in blue have stood up against Harvey Dent’s intimidations and the tsunami of positive press Harvey Dent has been reaping to tell their story. It is an astounding act of courage, and I commend them all for having the guts to tell the truth to the Gotham public. I salute each and every one of them. These police officers are some of the finest we have. Many have received medals for bravery on duty. All of them place their lives at risk every day to protect you and me. It was always obvious that Harvey Dent’s mad lust for power was corrupting his prosecutions. Now, we have proof. Affidavits and testimony by police officers that Harvey Dent threatened and bribed police officers to entice them to testify against their innocent brothers on the force. It is time to end the sorry chapter that Harvey Dent has forced upon the Gotham people. I expect his resignation from his job and his withdrawal from the race, if he has any honor at all left." We stand at a crossroads in Gotham. Ours is a city of great character, with unlimited potential and a creative, diverse, and hard-working families. But Gotham faces a critical problem -- growing crime. To take on the problem of crime, we need experienced leaders that target mobsters, thugs, and killers -- not the people who are sworn to protect us. If I'm elected District Attorney, I'll give the police the tools they need to fight crime -- because that's how we're going to make our streets safe. Every day I work hand in hand with the real heros of Gotham -- our brave men in blue. Gotham cops are some of the finest men I've ever had the honor to know. Every day, they put their life on the line to protect this city. They risk their lives because they believe in justice, in law, in order. And that's why the Gotham Police Union has endorsed me, Roger Garcetti. They've come to know me very well in my time in Gotham. I've always supported the police in every way possible. And now, when they are under attack by a "runaway prosecutor," they've turned to me once again. In their endorsement, they said, "Roger Garcetti has the integrity, the toughness, and the judgement to lead and win the war against crime. He is the best friend police have ever had, and we endorse him strongly." I am honored to have the support of Gotham police officers. They are the best people to answer the question, "Who will make our city safer?" And the answer is me, Roger Garcetti. Vote for me, and I will protect all the people of Gotham. Thank you for supporting the Garcetti campaign. By supporting me, you are choosing leadership and experience over rhetoric. Our website has suggestions for ways you can further support my campaign. Garcetti is the one man you can trust to keep us safe. He has the years of experience Gotham needs in this critical time. He believes we should support our brave men in blue, not try to put them in jail just to get a headline. So if you want to beat Harvey Dent -- if you want to elect Roger Garcetti as Gotham DA -- then show your support! Head down to your local Garcetti Campaign Office to pick up some placards, yard signs and bumper stickers, and then get out there and show your support for Garcetti! The Gotham Fraternal Order of Police says, "Garcetti has the experience, and partners with police to stop crime." 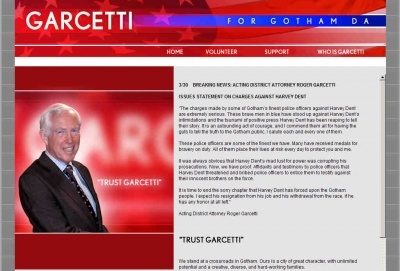 The Gotham Police Union says "Roger Garcetti has the integrity, the toughness, and the judgement (sic) to lead and win the war against crime." The Italian Heritage Society of Gotham says, "Roger Garcetti's dedication and loyalty make him the candidate to trust." It is with great sadness that I write this. It is becoming obvious that Harvey Dent will not resign his post and withdraw from the race. Even when it is clear that he has operated outside of the rule of law, intimidating, threatening, and bribing witnesses, and bringing shame upon himself and Gotham City. The testimony of the brave police officers against Harvey Dent is incontrovertible. Everybody with eyes to see recognizes that. But what has Harvey Dent done in response to these devastating accusations? A man with honor, with a sense of duty, with a love for Gotham would have already resigned his post and withdrawn from the race. But Harvey Dent, in his mad lust for power, is refusing to accept reality. Thus, it is with sadness that I announce that an official probe is underway to determine exactly how deeply Dent has betrayed Gotham City in his obvious prosecutorial misconduct. This week, the Garcetti for District Attorney Headquarters was full of energy, excitement, and great news coming in day after day. The week started off with Roger Garcetti picking up vital endorsements from the Gotham Chamber of Commerce, the Gotham Anti-Crime Commission, the Gotham Better Governing Association, and Citizens for a Better Gotham Future. Gotham is beginning to really hear Roger Garcetti's message of real experience and solutions for Gotham. We also were proud to pick up the endorsements of 189 active Gotham Police Department officials. In a one-page announcement in the pages of The Gotham Times, these brave men - who range in rank from Sargeant up to Colonel - said that "Roger Garcetti has proven that he is on the side of Gotham Police officers as we struggle to fight crime and protect this city's citizenry. We know that Roger Garcetti will be the strongest advocate of tough prison sentences for criminals and will fight to keep the Gotham Police Department working at the high level it is working right now." Poll numbers have also poured in, detailing Gotham citizens' rejection of Harvey Dent's corrupt, media-mad crusade against good cops. Also, we have a new shipment of lawn signs because the first shipment was snatched up fast! You can choose between our "Trust Garcetti" slogan and our new kicker "Garcetti: A DA Ready on Day One" Just stop by the headquarters! We are all grieving from the loss of a Gotham citizen during the tragic event's at Rossi's Deli on Sunday. All of us here send out our deepest regrets to the family of Mary Breitup, her parents, and sisters, and especially her two lovely children Andrew, 5, and Joseph, 8. Nobody can excuse Officer Frank Notaro's conduct. Let us not forget Sargeant Notaro's heroism. He won the Gotham Medal of Commendation for saving innocent bystanders in May of last year. Now in jail, Sgt. Notaro is surely suffering still from the tragic events of Sunday. But questions remain. What set the stage for the incident? What would drive a good cop to take such an action? The truth is that Harvey Dent set the stage for this tragedy with his insane, mad quest to put good cops in jail. It was Harvey Dent who put Sgt. Notaro in an impossible position. First, as Notaro testified, Harvey Dent offered him "cash money to lie" about a good cop that Dent wanted jailed for another big headline. Then, Dent swore he was going to prosecute Notaro himself when Notaro refused. So Frank Notaro was under an enormous amount of pressure. And then, when Sgt. Notaro had the courage to go public with the truth about Dent, the Dent machine laid the dirtiest smears imaginable on Notaro, calling him a corrupt liar. So who's responsible for Mary Breitup's death? Harvey Dent is. Just as he was responsible for the death of Mary's husband, Karl, who died in a scandalous shoot-out during another one of Dent's runaway prosecutions. Harvey Dent has killed two wonderful Gotham citizens, who were in love with each other. Harvey Dent has left their two children orphans. Harvey Dent should be ashamed of himself. 6/9 "I URGE MY SUPPORTERS TO VOTE ONLINE FOR ROGER GARCETTI"
This year, Gotham politics is experimenting with online voting. While I have never been a fan of change for change's sake, I believe that perhaps this new voting on the World Wide Web may hold advantages for absentee voters and voters who have trouble getting to the polls. I urge all of you to visit gothamelectionboard.com and join the Trust Garcetti movement. 6/4 "TRUST GARCETTI" MOVEMENT TARGET OF "MEDIA LYNCHING"
With all the media swooning over one certain competitor, Roger Garcetti stood up for the law-abiding citizens of Gotham today. "My campaign brings together people from all over the city who want a strong police force, not out-of-control vigilantes and mad prosecutors, to keep our city safe. But the media continues to paint my supporters as an insignificant group of thugs, very old people, and Dent-haters. This is completely false and a slander on all of my supporters." Garcetti made the statements at a campaign rally outside the Trust Garcetti headquarters. Roger Garcetti made clear that he believes in law, order, and justice today when he came out against the so-called "Save Batman" proposition. The proposition would create a Gotham where anybody could take up arms and try to act the hero, Garcetti said. "We are not the wild west," said Garcetti. "We need to fight crime the right way, not by sub-contracting the job to dangerous, unstable vigilantes." 5/21 GARCETTI SAYS "CITIZENS FOR BATMAN" A "DANGER TO ALL"
Roger Garcetti today stood up for law and order when he took issue with the dangerous group of out-of-control vigilantes calling themselves "Citizens For Batman." After a member of their group was arrested for assault at a gas station, Roger Garcetti was the only politician who had the guts to stand up against this group of bullies and thugs. "When will the politicians stand up for justice and shut down this reckless, irresponsible, and dangerous gang of hooligans?" said Garcetti. Roger Garcetti today announced a plan "guaranteed" to stop crime in its tracks in Gotham City. The plan, compiled with the help of top police officers, social scientists, and retired Generals from throughout the world, runs over 102 pages and features 57 recommendations. "This is the silver bullet we need to make crime history in Gotham," said Garcetti. After requests from the press to see the report, Garcetti made it clear how revolutionary the proposals are. "We cannot release the report now, since criminals would have prep time to try to outwit this plan," said Garcetti. As always, Garcetti is focused like a laser beam on the problems of Gotham City, not in making fancy speeches. Due to a surge in desire to own a "Trust Garcetti" T-shirt, the campaign has decided to offer a price break so that everybody who wants one can get one. From the previous price of $20, we now offer the "Trust Garcetti" T-shirt, which is 100 percent cotton and very comfortable, for only $10. And, for this week only, if you buy six of them, you get one for free! So stop on by the Trust Garcetti headquarters, and support the best District Attorney in the land! 5/3 ROGER GARCETTI URGES CITIZENS TO LOOK BEYOND "THEATRICS"
Lately it has become clear that the city is in the grips of some kind of feverish, overheated frenzy over the District Attorney's race. By the way some in the media talk, there is one competitor in the race who walks on water, can heal the sick, and could ascend to heaven at any minute. I ask all of you to take a close look at the choices facing you. We need solutions, not fancy talk or theatrics of a questionable nature. I offer the citizens of Gotham steady leadership in a troubled time. I am not a media-mad hotshot with a good haircut. I am a trained District Attorney who has brought the crime rate down, no matter how some try to enflame the public with talk of a "massive crime wave." We can continue the good work we have done and make Gotham City safe for all. But to do that, I need your support. The Gotham Police Department bestowed its GPD Citizen's Medal of Honor to Roger Garcetti in a simple ceremony on the steps of GPD's main office. Commissioner Loeb declared that "Roger Garcetti has never stopped in fighting for the rights of police officers and the safety of our citizens. He is truly a man among men." Roger Garcetti thanked the GPD, and vowed never to give up the fight against crime in the streets and "false prosecutions" in the courts. Amidst all the hullabaloo over Harvey Dent's so-called "courage" in the Rossi's Deli crisis, some serious questions remain. Frank Notaro was talking to Internal Affairs before he took hostages. Did they not know of his psychological condition? Did Dent's mad quest to incarcerate cops place so much pressure on Nataro that he committed this act? How did Harvey Dent know that the hostage taking would occur? Could it have been a deal between Notaro, looking for a break, and Dent, who desperately needed to change the subject after his campaign looked dead? Could Harvey Dent have agreed to a monstrous deal with Frank Notaro where Notaro would shoot up the Deli, take a hostage, and then Dent would "rescue" that hostage and appear "courageous"? Did Dent promise Notaro a break on any pending or future investigations? Thus, was Dent responsible for the death of Mary Breitup? I would like to take this opportunity to say a heartfelt "thank you" to all the men and women who supported my campaign. Together, we fought the good fight and you should take pride in all your hard work. I wish I could offer Mr. Dent my congratulations on winning the race for District Attorney, but in the face of his recent judicial persecution of me, I am unable to do so at this time. Dent's media-mad hunger for publicity which ends up wrecking good people's lives is continuing. I will continue to fight for my good name, and the best interests of Gotham City. As I prepare to fight Mr. Dent's groundless charges, I do so knowing that on my shoulders rests, perhaps, the future of Gotham City under the tyranny of Mr. Dent. If I succeed in stymieing his mad quest for prosecution, the rest of us can feel safe in our liberty. If I fail, I shudder for the future of Gotham. Thank you, and God Bless Gotham City. After the end of the countdown on Whysoserious.com/Overture, Trustgarcetti.com was "Jokerized." This page was last modified 18:09, 11 July 2008.